The data presented in Appendix I of Kalbfleisch and Prentice (1980) are coded in the following DATA step. The response variable, SurvTime, is the survival time in days of a lung cancer patient. Negative values of SurvTime are censored values. The covariates are Cell (type of cancer cell), Therapy (type of therapy: standard or test), Prior (prior therapy: 0=no, 10=yes), Age (age in years), DiagTime (time in months from diagnosis to entry into the trial), and Kps (performance status). A censoring indicator variable Censor is created from the data, with the value 1 indicating a censored time and the value 0 indicating an event time. Since there are only two types of therapy, an indicator variable, Treatment, is constructed for therapy type, with value 0 for standard therapy and value 1 for test therapy. 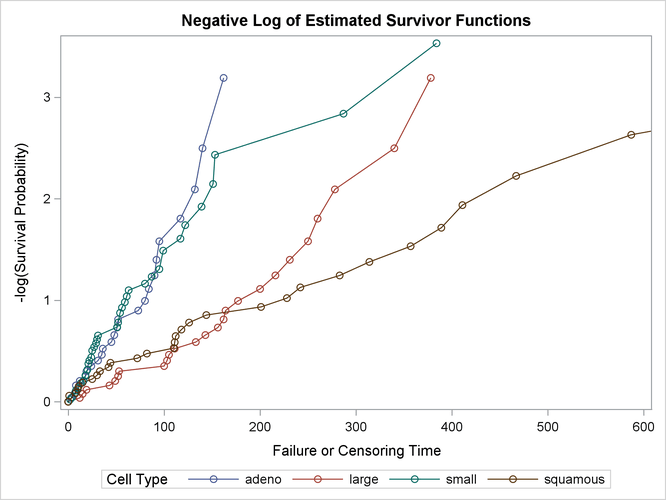 In the following statements, PROC LIFETEST is invoked to compute the product-limit estimate of the survivor function for each type of cancer cell and to analyze the effects of the variables Age, Prior, DiagTime, Kps, and Treatment on the survival of the patients. These prognostic factors are specified in the TEST statement, and the variable Cell is specified in the STRATA statement. ODS Graphics must be enabled before producing graphs. Graphical displays of the product-limit estimates (S), the negative log estimates (LS), and the log of negative log estimates (LLS) are requested through the PLOTS= option in the PROC LIFETEST statement. Because of a few large survival times, a MAXTIME of 600 is used to set the scale of the time axis; that is, the time scale extends from 0 to a maximum of 600 days in the plots. The variable Therapy is specified in the ID statement to identify the type of therapy for each observation in the product-limit estimates. The OUTTEST option specifies the creation of an output data set named Test to contain the rank test matrices for the covariates. 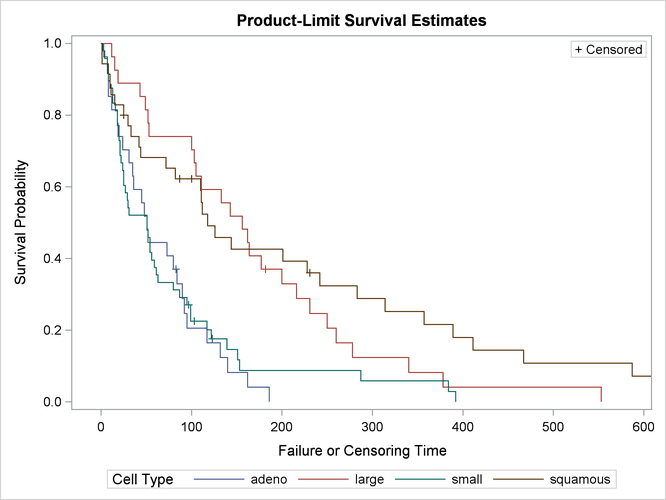 Output 70.1.1 through Output 70.1.4 display the product-limit estimates of the survivor functions for the four cell types. Summary statistics of the survival times are also shown. The median survival times are 51 days, 156 days, 51 days, and 118 days for patients with adeno cells, large cells, small cells, and squamous cells, respectively. The distribution of event and censored observations among the four cell types is summarized in Output 70.1.5. The graph of the estimated survivor functions is shown in Output 70.1.6. The adeno cell curve and the small cell curve are much closer to each other than they are to the large cell curve or the squamous cell curve. The survival rates of the adeno cell patients and the small cell patients decrease rapidly to approximately 29% in 90 days. Shapes of the large cell curve and the squamous cell curve are quite different, although both decrease less rapidly than those of the adeno and small cells. The squamous cell curve decreases more rapidly initially than the large cell curve, but the role is reversed in the later period. 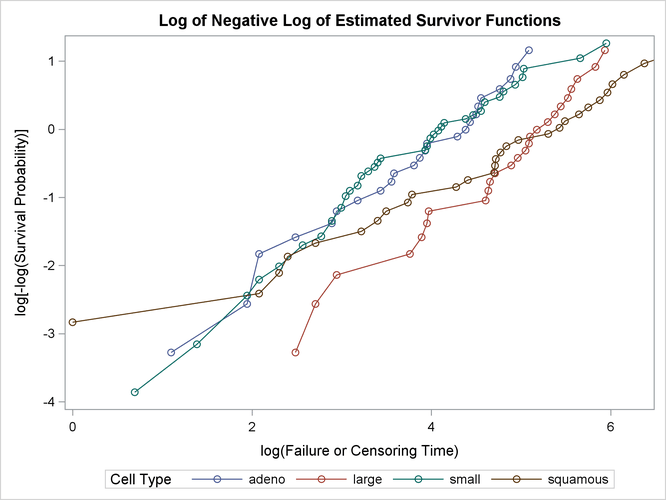 The graph of the negative log of the estimated survivor functions is displayed in Output 70.1.7. Output 70.1.8 displays the log of the negative log of the estimated survivor functions against the log of time. Results of the homogeneity tests across cell types are given in Output 70.1.9. The log-rank and Wilcoxon statistics and their corresponding covariance matrices are displayed. Also given is a table that consists of the approximate chi-square statistics, degrees of freedom, and p-values for the log-rank, Wilcoxon, and likelihood ratio tests. All three tests indicate strong evidence of a significant difference among the survival curves for the four types of cancer cells (p < 0.0001). Results of the log-rank test of the prognostic variables are shown in Output 70.1.10. The univariate test results correspond to testing each prognostic factor marginally. The joint covariance matrix of these univariate test statistics is also displayed. In computing the overall chi-square statistic, the partial chi-square statistics following a forward stepwise entry approach are tabulated. Consider the log-rank test in Output 70.1.10. Since the univariate test for Kps has the largest chi-square (43.4747) among all the covariates, Kps is entered first. At this stage, the partial chi-square and the chi-square increment for Kps are the same as the univariate chi-square. Among all the covariates not in the model (Age, Prior, DiagTime, Treatment), Treatment has the largest approximate chi-square increment (1.7261) and is entered next. The approximate chi-square for the model that contains Kps and Treatment is 43.4747+1.7261=45.2008 with 2 degrees of freedom. The third covariate entered is Age. The fourth is Prior, and the fifth is DiagTime. The overall chi-square statistic in the last line of the output is the partial chi-square for including all the covariates. It has a value of 46.4200 with 5 degrees of freedom, which is highly significant (p < 0.0001). -19.9435 46.9836 0.1802 0.6712 Prior Treatment? 4 46.4134 <.0001 0.1122 0.7377 Prior Treatment? You can establish this forward stepwise entry of prognostic factors by passing the matrix corresponding to the log-rank test to the RSQUARE method in the REG procedure, as follows. PROC REG finds the sets of variables that yield the largest chi-square statistics. Output 70.1.11 displays the univariate statistics and their covariance matrix for the log-rank test. Results of the best subset regression are shown in Output 70.1.12. The variable Kps generates the largest univariate test statistic among all the covariates, the pair Kps and Age generate the largest test statistic among any other pairs of covariates, and so on. The entry order of covariates is identical to that of PROC LIFETEST.